Seems to me that travelers are portrayed in two distinct lights; either all pulled together, fresh, perky, and clean or the Home Alone madman dash. After just having spent roughly 2 full days, 45 hours to be more precise, traveling I do believe that much depends the combination of the group dynamics along with the point in transit. Our group started at the pulled together, fresh, perky, excited and ended more sleep deprived & disheveled, but still excited. Thankfully, there was no mad dashing involved! 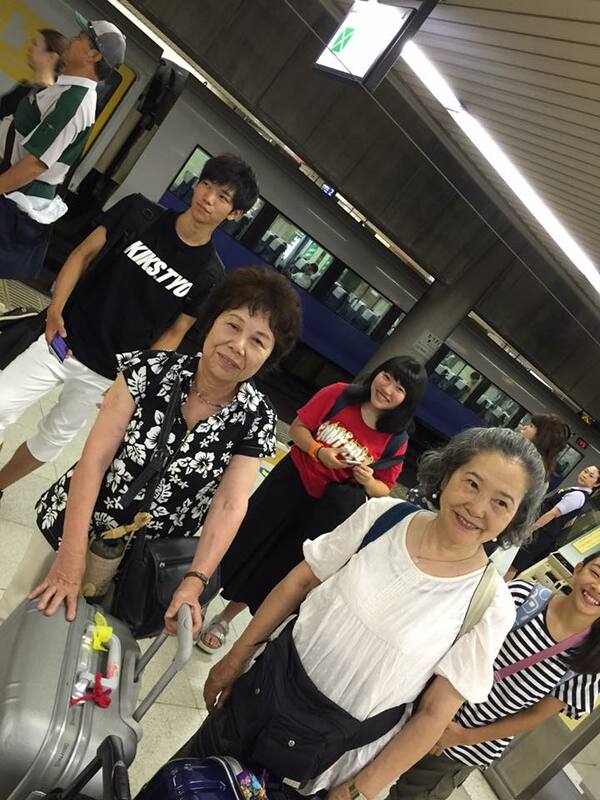 The main part of the group met at the Kashiwazaki station at 3:30 Thursday. 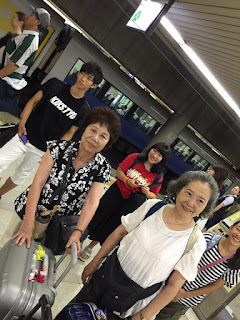 We met up with our last member of the group in Nagaoka before we boarded the Shinkansen. In Tokyo we met up with what felt like the entire population of Niigata prefecture all jam paced onto one train O_o *Note to self, remember rush hour and Tokyo trains in general when making travel plans & reservations!! We finally managed to arrive, check in, and make it to our rooms at an airport hotel by 9:30pm. Yes, it took us 6 hours of travel get us to the airport vicinity! Friday morning was airport time. Baggage claimed (most of us had wisely shipped our bags ahead to the airport) we headed to the check in counter where we entered into a counter jumping contest. Me to airport staff: "Which counter should we check in at?" Staff: "Go to counter L" Next Staff person: "Go to counter O" Next Staff person: "Go to counter P. Use this scanner to check in." Next Staff person: "Seems you cannot use the self check in, Go to counter Q" Whew, we still managed to gt checked in in a fairly timely manner. The students whizzed right through. I needed 3 shots to "whiz" through. First time, I didn't have the correct form. Things have changed and I did not see the tables set up with reentry paperwork so I went to the counter with nothing more than my passport, boarding pass, & foreign resident card. The officer scanned my passport & foreign resident card and told me to fill out "THIS side" of the paper he gave me. Second time... you must fill out the other side as well. Third time, with paper fully filled out, I whizzed right through. In Dallas/Fort Worth the students got to experience the 3rd times the charm fun of immigration. I must say that was more frustrating and stressful for all involved - even those of us who whizzed right through and had to wait! BUT eventually everyone was allowed to enter the good old US of A. We had two flights: Tokyo to Dallas and Dallas to Detroit. Both flights were pretty typical and went without complications. I did enjoy the privileged of flying without a special needs child. I actually managed to watch, and even enjoy, 2 movies. I slept some, read some, likely experienced what a normal person does on a flight...odd, very odd. In Detroit we were met by Jenn. Jenn was our summer intern a few years back and this year she is the state side coordinator for our home stay. 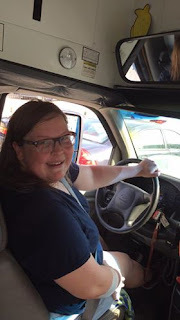 She is also the church bus driver! She got us from Detroit to Butler, in good time. We arrived at Christ's Church at Butler just after 8pm local time Friday or 9am Japan time Saturday. Now for the fun to begin!